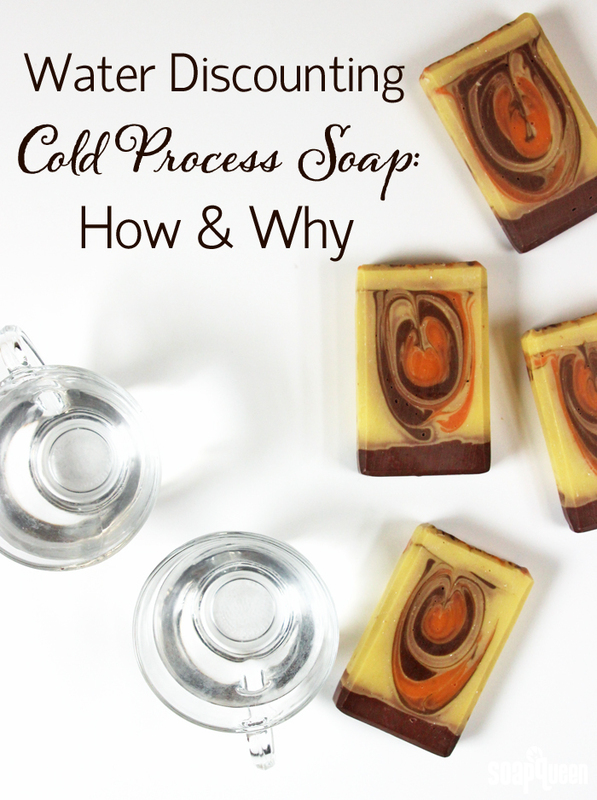 Water and lye are crucial components of cold process soap. 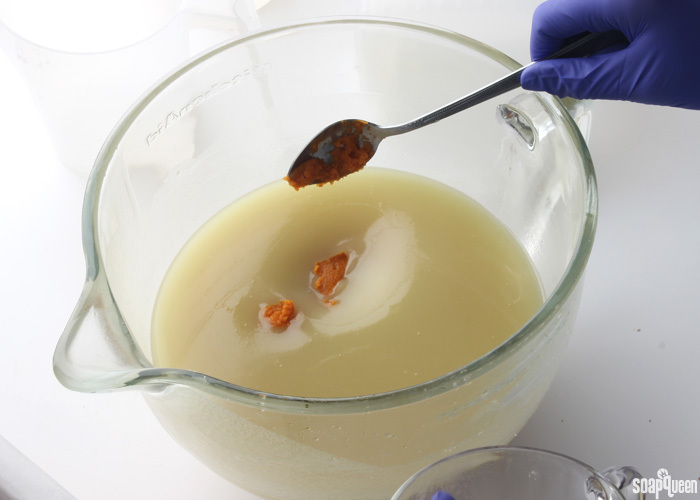 Water is used to dissolve the sodium hydroxide lye so it can interact with the soaping oils to begin the saponification process. As the soap cures, some of the water evaporates and makes a harder, longer-lasting bar of soap. How much water you use in your soap will depend on the calculator you use. You may also choose to “water discount” the recipe and use less than what is called for. If you’re unfamiliar with how the saponification process works, click here to learn more about the balance of lye and oils. Using less water than originally called for in a recipe is known as a “water discount.” There are several reasons why you may want to water discount soap. Water discounting helps the soap release from the mold faster. Using less water also results in a shorter curing and drying time, as there is less water to evaporate from the soap. Soapers may also choose to water discount if the recipe contains additives that naturally contain water, like fruit or vegetable purees. Using less water can reduce the chance of soda ash and glycerin rivers. In addition, water discounting affects the temperature at which soap goes through gel phase. Water discounting has plenty of benefits. Water discounting is a great way to avoid glycerin rivers (shown above). Learn more about how to avoid glycerin rivers here. You may be thinking, “If there are so many great reasons to water discount, why don’t soapers do it all the time?” Some soapers do choose to water discount with every recipe. The trick is that water discounting a soap recipe can cause the soap batter to thicken quickly. Generally, the more a recipe is water discounted, the faster the soap thickens. This is because the lye solution is more concentrated, which speeds along the emulsification process. The water content also affects when soap goes through gel phase and how it reacts to heat. A fantastic (and beautiful!) demonstration of this is shown in The Ghost Swirl by Clara of Auntie Clara’s Handcrafted Cosmetics. In this post, Clara demonstrates wonderfully how soap is affected by water content. Because a water discount causes the soap to accelerate faster, water discounts can make a recipe difficult to work with. If your recipe contains a large amount of hard oils or an accelerating fragrance oil, you may want to avoid water discounts. I generally recommend water discounting for more advanced soapers who are prepared to work with a faster moving trace. If you’re looking for more information, the All About the Trace post is full of tips and photo examples of thin vs. thick trace. Water discounting a recipe can cause the soap to accelerate, resulting in a thick trace. 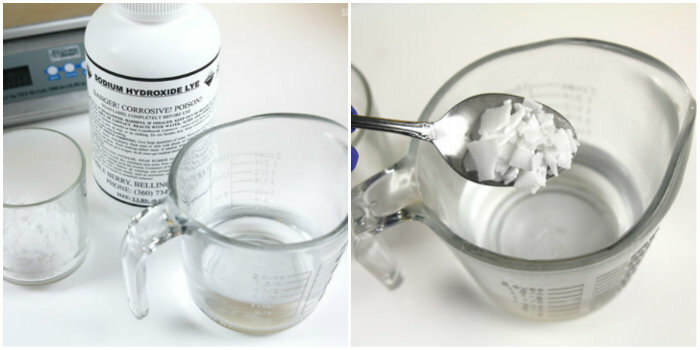 Technically, there is not an “absolutely correct” amount of water to use in your soap recipe. In fact, if you plug in your recipe of soap making oils into various lye calculators, you may end up with slightly different amounts. 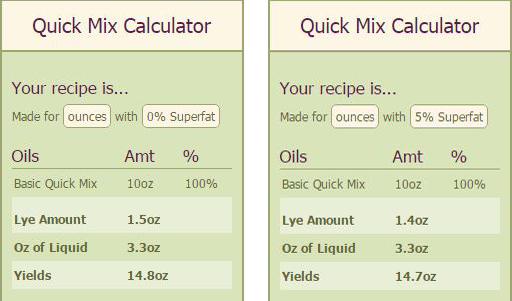 Water is roughly 22% of the total recipe (oils + lye + water) when calculated with the Bramble Berry Lye Calculator. Other lye/soap calculators may give a slightly higher or lower amount. The amount of water in a recipe is determined by the amount of lye, not the amount of oils in your recipe. The important part of determining how much water to use in your recipe depends on the ratio of lye to water you prefer. Remember, the lye solution is created by dissolving and diluting lye into distilled water. A common dilution rate is 30% lye and 70% water. In other words, the total makeup of the lye mixture is 1 part lye to 2.3 parts water. When the ratio of lye to water increases, the mixture is more lye concentrated. For example, a solution with 40% lye and 60% water (with a ratio of 1 part lye to 1.5 parts water) is more highly concentrated, because it contains less water in the total mixture. The Bramble Berry Lye Calculator produces lye and water mixtures with a ratio of roughly 1 part lye to 2.4 parts water. This ratio will change slightly depending on the superfat percentage of your recipe. For example, let’s take a look at two similar recipes for the Basic Quick Mix. Both recipes contain 10 ounces of oils. One has a superfat of 5% (shown on the right) and the other has a superfat of 0% (shown on the left). As you can see below, the water amount stays the same. But, the ratio of water to lye changes slightly; the soap with a 0% superfat has a ratio of 1 part lye to 2.2 parts water, while the soap with the 5% superfat has a ratio of 1 part lye to 2.4 parts water. Soap with a higher superfat has a less concentrated lye mixture than soap with a lower superfat. You’ll notice that in this example, the amount of water actually stays the same. This example is technically not a water discount; when you use a higher superfat in your recipe you are actually calculating a lye discount! Kinda cool right? The lye to water ratio of the lye solution will depend slightly on the superfat percentage of your recipe. Some soapers prefer to not use the water amount given by lye calculators at all! For example, Amanda of Lovin’ Soap Studio prefers to double the amount of lye in her recipe to get the water amount. Read more about her water calculation here. How much water you choose to use in your recipe depends on personal preference, in addition to the oils, fragrance, colorants and additives in the recipe. If you are looking at the total weight of this recipe (oils + water + lye), the water makes up 22% of the recipe. The lye to water ratio of the lye solution is roughly 1 part lye to 2.3 parts water. This is equivalent to roughly 30% lye and 70% water. Let’s do a water discount of 10%. Ninety percent of 11.2 is 10.08 (11.2 x .9 = 10.08). We can round this up to 10.1 oz. to make it easier to measure. This is the new water amount for your recipe. The amount of lye will stay the same. Remember, when you decrease the amount of lye, you are creating a lye discount which will increase the superfat of your soap. The lye and water solution will now have a ratio of 1 part lye to 2.1 parts water. Or, the mixture is now 32% lye and 67% water. This seems like a small change, but it can make a big difference. It is possible to water discount too much. If your solution contains too much lye and not enough water, the mixture can become extremely hot and very, very dangerous. In addition, the lye may not have enough water to dissolve fully. In general, the absolute highest ratio of water to lye is 1:1. This means there is equal parts lye and water in the mixture, or 50/50. At this ratio, the lye is still able to dissolve, but will be very concentrated and somewhat difficult to work with. I do not recommend this ratio of water to lye. Some advanced soapers use a ratio of 40% lye to 60% water, but this is still an extremely concentrated solution, and may be very difficult to work with. So, when should you water discount your soap? Technically, you can water discount any batch you’d like! Just be prepared to move quickly. You may want to have a backup plan if the soap becomes too thick. If you’re adding ingredients that give the recipe additional water (like purees) that’s also a good reason to do a water discount. 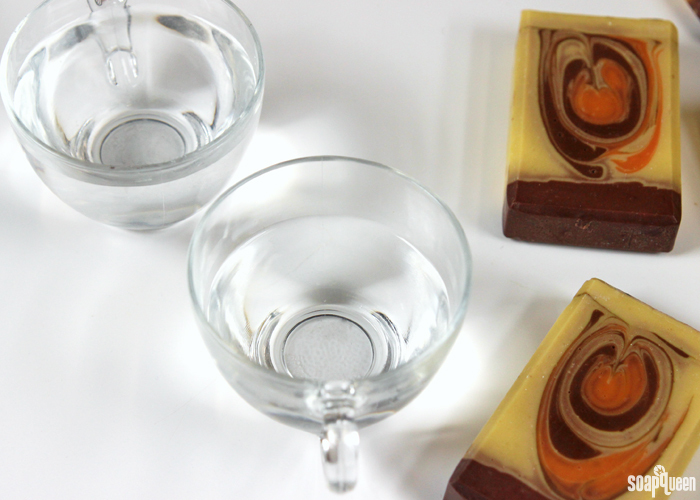 In the Pumpkin Spice Swirl Soap, pumpkin puree is added which gives the recipe extra water. A 15% water discount prevented the recipe from containing too much water. A great example of water discounting a recipe to account for water-filled additives is the Pumpkin Spice Swirl Cold Process Soap. This recipe contains 2.5 oz of pumpkin puree, which contains water. It’s tricky to know for sure just how much of the puree is comprised of water, so it’s a bit of a guessing game. I went with a 15% water discount, which gave me a ratio of about 1 part lye to 2.1 parts water. I could have done a little bit of a steeper discount, but I wanted to make sure I had time to swirl. How much you water discount depends so much on your recipe, personal preference and comfort level. 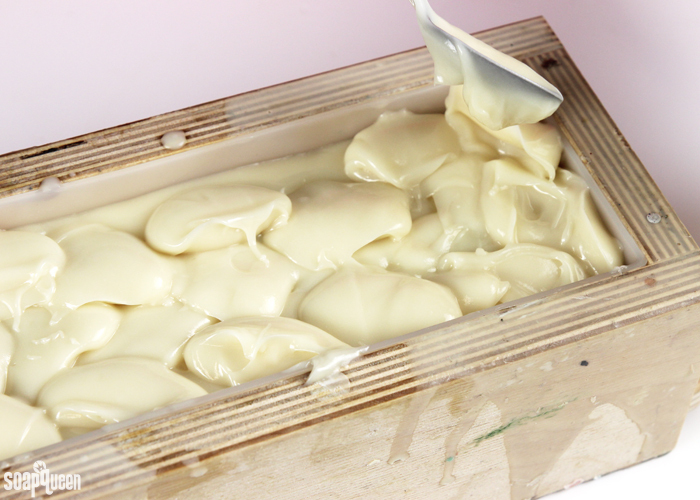 Generally, the soap will be able to be removed from the mold faster. Reduced water in the recipe cuts down on the 4-6 week cure time of cold process soap. Less water can prevent glycerin rivers from occurring. This is particularly helpful if your recipe contains a large amount of titanium dioxide, or will become extremely hot. Click here to read more about what causes glycerin rivers and how to prevent them. Water discounting your recipe can help prevent soda ash. Click here to read more about soda ash, including how to prevent it. Water discounting can accelerate trace, which can result in very thick soap batter. Click here for more information on trace. 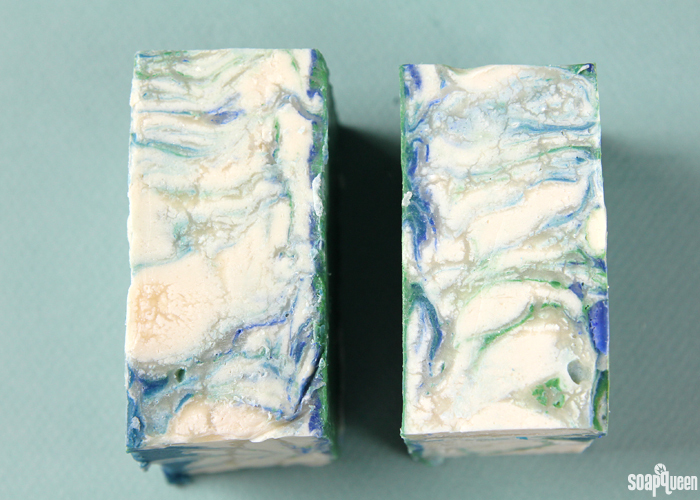 If your soap accelerates, it can make some complicated soap designs like swirls difficult to execute. Water discounting can make it more difficult to work with accelerating fragrance oils. Read more about working with accelerating fragrance oils here. Soap with a lower water content requires higher temperatures to go through a full gel phase. If you like your soap to go through a complete gel phase, water discounting makes this a little more difficult. See a beautiful example of this in The Ghost Swirl by Auntie Clara’s Handcrafted Cosmetics. Do you water discount your cold process recipes? I would love to hear about your methods for discounting! It depends so much on personal preference, and I’m interested to know what works for you, and what doesn’t.